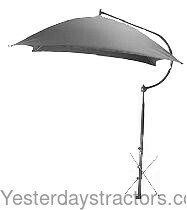 Deluxe Umbrella comes with universal mounting bracket. Four spring steel bows are locked into place with individual spring clips, providing ease of operation and a rigid framework. Frame constructed of tubular steel. All metal parts are zinc plated for rust resistance. 54 inch square cover is made of durable polyester material. Each corner is double reinforced. AVAILABLE IN RED, YELLOW, ORANGE, WHITE or BLUE. State color desired in comments section of order form when ordering. New, aftermarket Deluxe Tractor Umbrella for sale with a solid manufacturer warranty. In addition, we have a generous 30-day return policy if this Deluxe Tractor Umbrella for all John Deere tractors needs to be returned for any reason. Please see our Parts Warranty and Return Policy links on your left for complete details before returning. Delivery is via UPS Ground or USPS Priority and usually takes 3-5 business days. The shipping charge will be displayed in your online shopping cart. To purchase this deluxe tractor umbrella, click the "Add to Cart" button or call toll-free 800-853-2651.